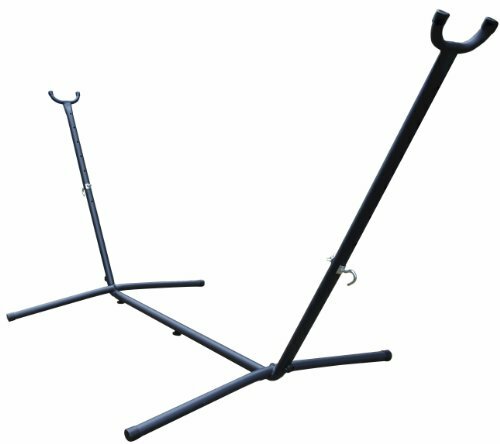 This space-saving universal 9 foot hammock stand is constructed of heavy duty steel and assembles in minutes without any tools. You'll enjoy the freedom the stand provides by allowing you to set up your hammock in the most convenient location and no longer rely on those 2 perfect trees. Heavy duty construction in powder coated steel with plastic caps on the ends of the tubing to create a soft finish. Carrying case is included. Assembly required. 450 pound capacity. 108 x 48 x 44 inches. Space saving design is ideal for decks, balconies, porches, etc.